This Flashback was prompted by a recent gathering in Hamilton of digital designers, who were asked to re-imagine Jackson Square , especially it’s underwhelming front entrance. These shots from the Spec Archives show a what the area looked like before construction. 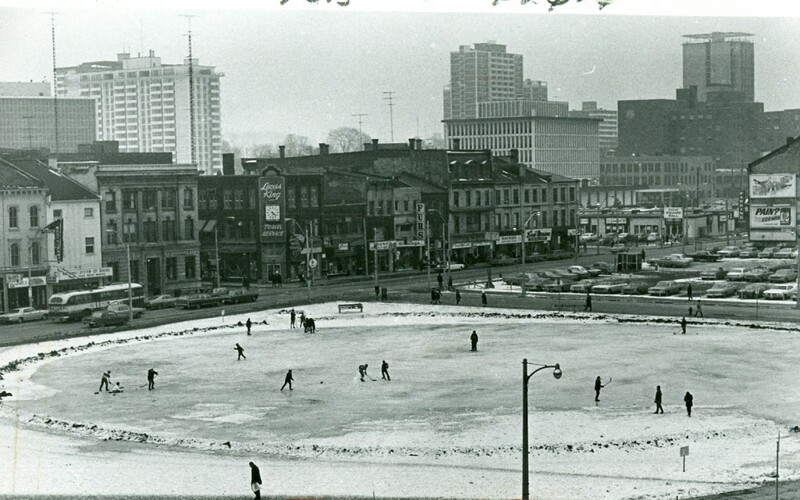  Archived in Flashback and tagged Hamilton Ontario, Jackson Square. Bookmark the permalink. Thanks for publishing the picture of skaters. It was my idea as CKOC broadcaster to make use of the empty lot for a natural ice rink. We ran a promotion and filled the space with winter fun. Forecourt of City Hall would have been a good location after the reno.